SACRAMENTO, CALIFORNIA (August 31, 2017) – The Tri-Holiday #3 and eighth round of the 2017 Pacific Challenge Series presented by PenneyLawyers.com hits Stockton 99 Speedway on Saturday night. The championship battle between 2015 champion John Moore and 2014 champion Mike Beeler continues as part of the ten race Super Late Model series. Moore is one of seven different race winners in the seven PCS races so far this year. His victory came during the prestigious Ron Strmiska Memorial 125 at Stockton in July. His other PCS win at Stockton came during the 2015 July event. In eight starts, Moore has seven top-five finishes. He leads Beeler by 12 points in the title fight. Jeff Bischofberger earned his first PCS win of his career when he won Tri-Holiday #1 in May. Bischofberger drives for championship-winning JD Motorsports which won both the 2012 and 2016 titles with Jeremy Doss behind the wheel. Beeler has a pair of wins at Stockton including the 2016 Ron Strmiska Memorial and the 2015 Tri-Holiday #3. Beeler has finished in the top-two in the standings every season since 2014, finishing second to Moore in 2015 and to Jeremy Doss in 2016. In 11 PCS starts at Stockton, the veteran drivers has a strong ten top-tens. Third in the championship battle is Cole Moore, son of John Moore. 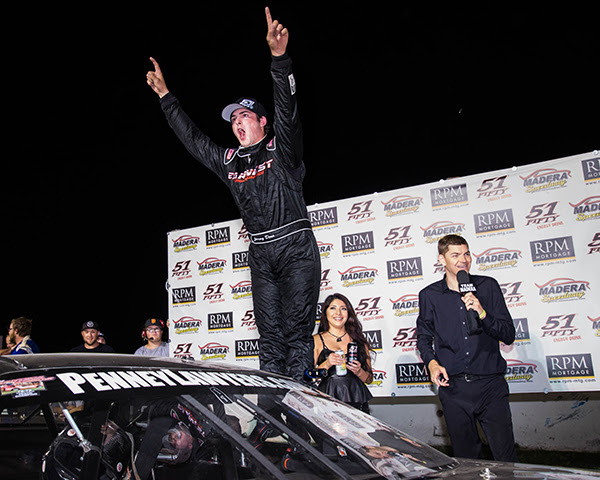 The 2015 PCS Rookie of the Year has fallen 48 points adrift of the championship but has had a strong campaign that included three consecutive fast-times and the June 17th victory at Roseville that was his first career Late Model win. Stockton has been one of the strong points of the year with a pair of runner-up efforts. 2016 Rookie of the Year Matt Wendt returns to his home track where he was the Tri-Holiday champion in Super Stocks previously. Wendt has a sixth place finish and a seventh place finish at Stockton this season. He has accumulated a perfect record of five top-tens in five PCS starts at the historic quarter-mile. 2017’s leading rookie Jack Wood rounds out the top-five in the championship bolstered by running in the top-ten in all seven races so far. He has run sixth and eighth in his only Stockton PCS appearances in his young career. The sixth place run in July is also his series best finish. Wood’s cousin Travis Milburn is the defending winner of Tri-Holiday #3 and is sixth in the standings. Jason Romero finished third at Stockton in May and is seventh overall ahead of Tracy Bolin, Chris Scribner, and Mike Hite. Former Stockton Late Model champion Matt Scott has worked his way up to 12th in the points and is expected to compete on Saturday night. Scott has a career best finish of third in PCS races at the speedway. Former Stockton feature winner in the 90s Greg Kamper is attempting a return to his home track as well after many years out of action. Ross Strmiska aims to make his tenth career PCS start at his family’s home track, as the third generation driver still chases an elusive series win. Justin Philpott is also expected to compete. Racing action on the hot weekend gets started on Friday night with open practice. Pit passes are $40 with pit gates opening at 2 p.m. and on track activity to follow. On Saturday, pit gates open at 1 p.m. with practice at 3 p.m., qualifying at 6 p.m. and racing to follow. Stockton Late Models, Bombers, and Mini Cups make up a popular undercard for the action! Tickets are Adult (16+) $20, Jr. (11-15), Sr. (60+) & Military with ID $15, Kids 10 & Under FREE, and a Family Pass (2 Adult, 2 Jr.) $55. Eureka, CA (August 28, 2017) – Only two race weekends remain for teen driver, MKinzy Uselton in the 2017 season. The second-year youngster was the points leader of Redwood Acres Raceway’s Legends division and will look to regain her advantage in the next race on September 9th. Though Uselton has yet to win her first feature event, she was able to claim her first ever victory in heat race action on May 13th. Uselton has gone from never having drove a car prior to 2016 and has steadily progressed every week. MKinzy is the only driver who’s started every race in the Legends division at RAR in 2017. Her best finish was second place on June 10th. She has two other top five finishes, a third on April 29th and a fifth on August 5th. Uselton has also steadily improved on the dirt as she has been a competitor in Redwood Acres Raceway’s 500/open outlaw kart division. Uselton has gained pace and showed in in qualifying for the most recent race on August 27th when she set a time of 10.492. In comparison, Uselton ran an 11.992 in her first ever qualifying session on the dirt. MKinzy’s younger sister, Aaliyah is looking to follow in her sister’s footsteps as she has recently taken to the track in a beginner box stock. The eight-year-old started off the season at the mid-way point and has drastically improved. This past weekend, Uselton placed sixth only one lap off the pace her best finish in her third ever race. The Uselton sisters are granddaughters of former fan-favorite Acres driver, Lissa Uselton. MKinzy’s Legend race team is led by her crew chief and grandfather, Brett Uselton aka “Papa” who also serves as crew chief on her kart. 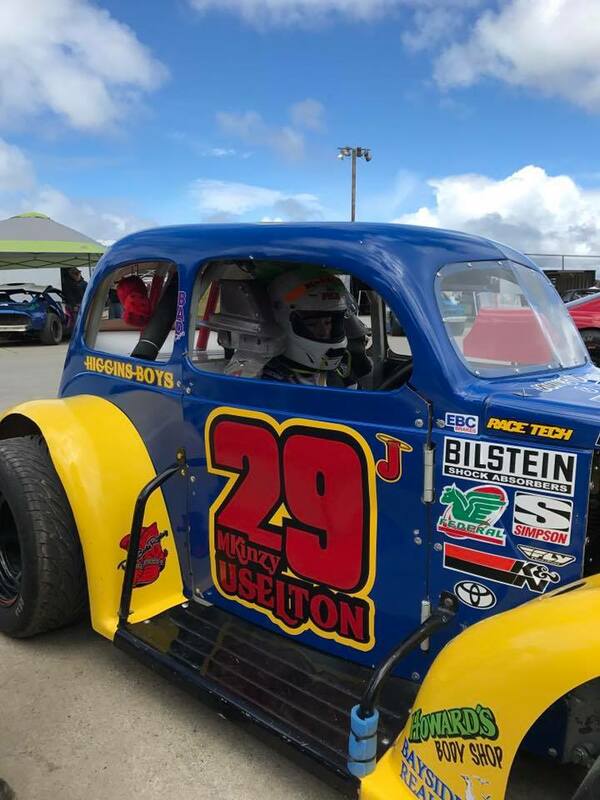 Uselton’s 250 kart is owned by Fredy Champagne and is also crew chiefed by Brett Uselton aka “Papa”. The rest of the MKRacin’ 29j Team is made up of Lil John Jameson, Lissa Uselton, Brent Mack, and Aaliyah Mitchell. SACRAMENTO, CALIFORNIA (August 28, 2017) – The Pacific Challenge Series presented by PenneyLawyers.com has added an additional round to the 2017 Super Late Model series, with a race at All American Speedway in Roseville, CA set for September 16th. With the additional date, the total calendar increases to 10 races. The event serves as a makeup to a rained out race in April. The series is in the midst of a very close championship battle between John Moore, Mike Beeler, and John’s son Cole Moore. Both John Moore and Beeler are former series champions while Cole Moore is the 2015 Rookie of the Year. 2016 Rookie of the Year Matt Wendt and 2017’s leading rookie Jack Wood round out the top-five in the standings. Seven different drivers have tasted victory lane in seven PCS races this season. Cole Moore won his first career race in the series’ appearance at Roseville on June 17th with Beeler finishing second. Multi-time track champion Matt Scott finished third. The Pacific Challenge Series competes this Saturday night at the Stockton 99 Speedway for its eighth round of 2017 and also the third Tri-Holiday Series race of the year. The Labor Day classic was won by Travis Milburn last season and Beeler in 2015. All American Speedway hosts the series finale on October 14th as well. Eureka, CA (August 28, 2017) – A packed house was in attendance this past weekend at Redwood Acres Raceway. It was Anderson Logging Driver Appreciation Night and the thrill of the racing was likely matched with the thrill of the opportunity for fans to meet their favorite drivers during the on-track meet and greet. With the packed schedule for the evening, track officials opted not to run heat races for all divisions with the exception of the Legends and late models. Tim Buzzard, Jr. made his first visit to the Acres on the weekend as was fast time in the California State And Federal Employee’s Credit Union with a 20.750. The 20-lap main event was ran half forward and half backward around the 3/8-mile track. The first five laps saw the lead change hands between three drivers, Andy Savage, Tim Ratzlaff and Nick Ford. Buzzard, Jr. moved to the lead on lap six and held it until the mid-race caution flag where the field was turned around to race in the opposite direction. Daniel Buell gained the advantage on lap 11 before giving way to Buzzard, Jr. on lap 12. Buzzard, Jr. led until the final lap when he and Ford got together in turn four. Buell was able to sneak by the incident to claim the win. Buzzard, Jr. and Ford crossed the line in second and third. Rookie, Lindsey Zito continues to impress as she finished fourth and another Acres visitor, Michelle O’Dell placed fifth. Qualifying for the Nor-Cal Automotive Legends division was paced by Cottonwood, California driver, Derek Copeland with an 18.064. Copeland followed up his fast time with wins in both the trophy dash and heat race. Daniel Whitley led the first four laps of the 25-lap main event. On lap five, Copeland powered to the lead, a position he would never relinquish. Whitley had a fight for second with Tyler Peach nipping at his heels. Whitley spun on lap 16 bringing out the caution. The yellow flag only delayed the inevitable for Copeland and he took the victory. Robert Miller was second followed by Joe Brattoli, Peach and Whitley. Fast time for the Fortuna Wheel & Brake bombers was John Lally with an 18.461. Jim Redd came out on top in the four-lap dash. Kolby Jackson led the opening three laps of the 25-lap main event. On lap four, bomber rookie Sam Brown took over. Brown was impressive as he held the lead for the majority of the race. Sadly for him, the chance for victory was taken away. On lap 16, Jeff French maneuvered his car to the race lead. From there on it was French’s race. At the finish it was French taking his second main event win of the year. Brown took second as Jackson, Chris Naughton and Bethany Rapp rounded out the top five finishers. As the season as progressed, Brett Murrell has served notice to the Humboldt Hydroponics mini stock class that he is the top driver in the division. He set fast time with an 18.830. Scott Taylor held on to claim the trophy dash. Troy Lee used his pole position staring spot to lead the first five laps of the 25-lap main event. On lap six, Brett Murrell took over. Brett’s older brother Brian made his first start of 2017 and showed no signs of rust as he ran in second for most of the race. On the seventeenth circuit, Eugene Palmer got by for second. Palmer did all he could to try to close in on the leader but just didn’t have enough. Brett Murrell crossed the finish line first ahead of Palmer. Taylor was third with Murrell, Jr. fourth and Lee fifth. Ronnie O’Neil set quick time for the Lone Star Junction Thunder Roadsters. O’Neil’s time was 17.374. Tommy Payne was able to hold of O’Neil in the trophy dash to take the victory. O’Neil dominated the majority of the race but a late yellow flag bunched the field. The restart saw some of the best racing at the Acres all year as O’Neil and Payne went door-to-door for the final six laps. The lead changed between the two drivers three times before O’Neil was able to gain the advantage on the low line. Payne never gave up and on the final lap he made a last ditch effort to get by O’Neil. Payne didn’t have quite enough as O’Neil took the victory by only 43-thousandths of a second. Chris Lawrence was third, Tyler Peach fourth and Paul Baker fifth. 22 drivers showed up for the Super 6 Late Model Challenge Series race sponsored by Anderson Logging, Danielson Construction, Mid-City Motor World and North Coast Lighting And Electric. Brandon White narrowly was the fast qualifier with a 15.761. As always, the heat races determined the starting positions for the 75-lap main event. Eddie Klein won the first heat and Marty Walsh in second. Dennis Delbiaggio opened some eyes as he won the third heat which gave him pole position for the feature event. The field narrowed down to 20 as both Jim Walker and Mike Bourbon had issues that prevented them from starting the event. Dane Nissen grabbed the lead briefly before giving way to Mic Moulton on lap four. Moulton led until lap 30 until it appeared a right front tire went down on his car. Moulton pitted under yellow handing the lead to David Henderson. When the race got going, it was clear that Henderson had one of, if not the best car in the field as he was able to pull away from second place, Brandon White. The caution flew on lap 50 when George Young hit the wall hard coming off turn two. Thankfully Young was okay but his car showed severe damage from the incident. Several late race yellows put Henderson on the hot seat as he needed to make perfect restarts. Only once did White seriously challenge Henderson. Back in the pack, Moulton was making a fantastic recovery as he drove from the back of the pack in thrilling fashion. Nobody had anything for Henderson though and he was able to take his second win of the year by nearly two seconds. White held on for second while Moulton got by his lead title rival, Eric Gannon for third on the last lap. Dane Nissen returned from being away from on-track action as he rounded out the top five. Racing takes a break at Redwood Acres for Labor Day weekend and will return September 9th. Joining the roadrunners, Legends, bombers, mini stocks and Thunder Roadsters will be the North State Modified Series which will be making their third and final stop at RAR this season. The Super 6 Late Model Challenge Series will return for the Fall Spectacular on September 30th and October 1st. The track champion for the late models as well as all five other divisions will be decided that weekend. ROSEBURG, Ore. -- Whatever he lacks in experience, Todd Gilliland makes up for in moxie. The 17-year-old from Sherrills Ford, North Carolina, won a fiercely contested Clint Newell Toyota 150 presented by NAPA Auto Parts Saturday night at Douglas County Speedway. Gilliland fought off runner-up Chris Eggleston in a side-by-side battle for the lead, in which sparks literally flew off the fenders and bumpers of both cars as they nipped each other’s heels on the .375-mile semi-banked oval. It was the NASCAR Next driver's sixth NASCAR K&N Pro Series West victory of the season, with a final margin of victory of .155 seconds. In just his 26th K&N Pro Series West career race, Gilliland picked up his 13th victory. His Bill McAnally Racing teammate, 28-year-old Chris Eggleston from Erie, Colorado, won the Coors Light Pole earlier in the day. It was his fourth pole of the season and unlike tonight, he went on to pick up the win in three of those races after starting in the top spot. The teammates swapped the lead nine times, including four times in the closing 25 laps. Sunoco Rookie of the Year candidate Derek Kraus completed a BMR sweep of the podium with his third-place run, while fellow rookie Will Rodgers finished fourth. Julia Landauer rounded out the top five. Buddy Shepherd, Michael Self, Todd Souza, Trevor Cristiani and Matt Levin completed the top 10. 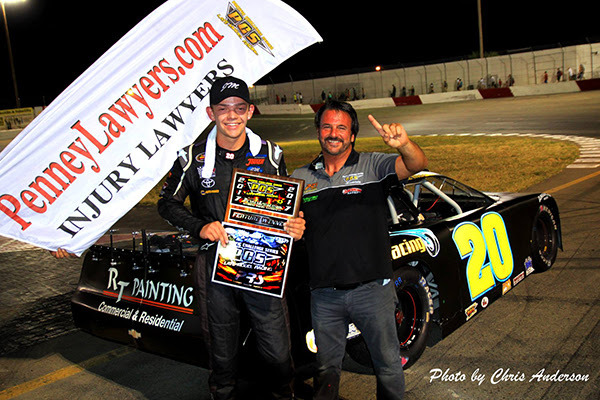 With the win, Gilliland pushed his points lead to five over Eggleston. Kraus is third in the standings, two ahead of Rodgers, while Self completes the top five. The Clint Newell Toyota 150 presented by NAPA Auto Parts will air on NBCSN, Saturday, Sept. 2 at 8:30 p.m. ET. 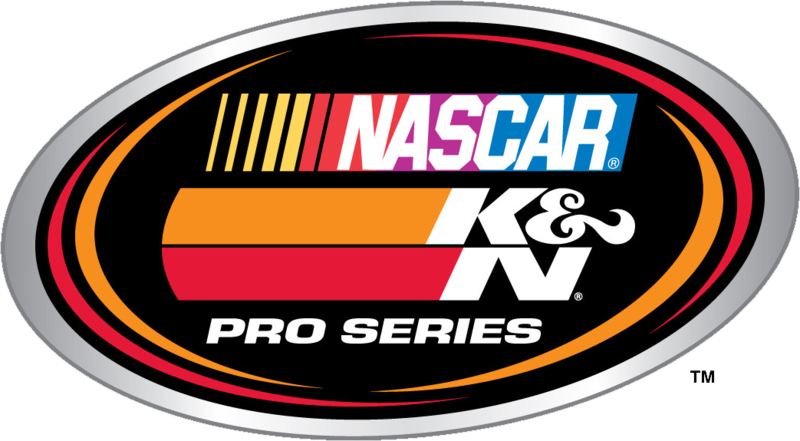 The NASCAR K&N Pro Series West will be back in action in the NAPA Auto Parts Idaho 208 at Meridian Speedway on Saturday, Sept. 30. 1. (3) Todd Gilliland, Sherrils Ford, N.C., Toyota, 150 laps. 2. (1) Chris Eggleston, Erie, Colo., Toyota, 150. 4. (5) Will Rodgers, Solvang, Calif., Ford, 150. 5. (6) Julia Landauer, New York, N.Y., Ford, 150. 6. (9) Buddy Shepherd, Bakersfield, CA, Ford, 150. 7. (7) Michael Self, Park City, UT, Ford, 150. 8. (13) Todd Souza, Aromas, Calif., Toyota, 149. 9. (10) Trevor Cristiani, Boise, Idaho, Chevrolet, 149. 10. (12) Matt Levin, Tucson, Ariz., Chevrolet, 149. 11. (15) Takuma Koga, Nagoya, Japan, Chevrolet, 148. 12. (8) Nicole Behar, Spokane, WA, Toyota, 148. 13. (19) Jesse Iwuji, Carrolton, Texas, Chevrolet, 148. 14. (17) Stafford Smith, Eagle, Idaho., Ford, 147. 15. (14) Kody Vanderwal, LaSalle, Colo, Ford, 147. 16. (18) Dan Phillippi, Los Angeles, Calif., Chevrolet, 144. 17. (11) Blaine Perkins, Bakersfield, Calif., Chevrolet, 143. 18. (4) Ron Norman, Tucson, Ariz., Chevrolet, 120. 19. (16) Andrew Engberson, Copper Canyon, TX, Ford, 114, brakes. 20. (20) John Wood, Eagle, ID, Chevrolet, 100, brakes. 21. (21) Zachary St. Onge, Upland, CA, Chevrolet, 46, electrical. Lead Changes: 9 among 2 drivers. Lap Leaders: C. Eggleston 1-72; T. Gilliland 73-75; C. Eggleston 76-78; T. Gilliland 79-81; C. Eggleston 82; T. Gilliland 83-131; C. Eggleston 132-135; T. Gilliland 136-138; C. Eggleston 139-148; T. Gilliland 149-150. Standings: 1. T. Gilliland, 481; 2. C. Eggleston, 476; 3. D. Kraus, 406; 4. W. Rodgers, 404; 5. M. Self, 387; 6. T. Souza, 364; 7. J. Landauer, 361; 8. M. Levin, 354; 9. N. Behar, 348; 10. K. Vanderwal, 341. MADERA, CALIFORNIA (August 26, 2017) – Two-time Pacific Challenge Series champion Jeremy Doss of Upperlake, CA made the most of his RPM Mortgage Pro Late Model Series debut, winning Saturday’s 100 lap event at Madera Speedway. The winner of nearly 30 Super Late Models in his young career handled a pressure-filled second half of the event before earning the $2,000 win. Jesse Love IV won his fourth 51FIFTY Energy Drink Jr. Late Model race as well as he edged closer towards the series championship. The sixth round of the MAVTV-televised competition had 26 Pro Late Models competing. Doss and incoming second in points Logan Zampa traded spots atop the board in practice and qualifying with Zampa earning five points for the fast-time. The fan-led redraw placed multi-time MST track champion Kevin Thompson on the pole with Zampa and Doss coming out of row two. Thompson was quickly passed by outside pole sitter Joey Licata. Doss and former series champion Matt Erickson moved into second and third with side-by-side battling behind them. Shane Butler spun in turn four for the first caution on lap five. Thompson had fallen back to seventh and gathered up Zampa, the June winner, back to eighth. Licata slowed under caution and retired to the pits with mechanical woes to surrender the lead. Doss assumed the lead position and powered past Erickson on the restart with five-time Jr. Late Model winner Austin Herzog of Clovis up to second. The top four of Doss, Herzog, Erickson, and tenth starting Garland Tyler of Modesto ran nose-to-tail all up stairs with Bakersfield’s Racin Vernon and Zampa side-by-side for fifth. Zampa used the inside to pass Vernon and Tucker tried to do the same. Zampa scrambled back to the top but Tucker remained on the bottom in traffic. The gap between Doss and Herzog grew to nearly a straightaway. A caution flew on lap 21 for Shane Butler tagging fourth running Tyler while being lapped. Tyler smacked the turn two wall and drove back to the pits with significant right front damage. Herzog briefly showed his nose on the inside of Doss on the restart before they separated. Tucker worked his way up to the inside of Erickson for fourth. Jr. LM graduate Jarrett Gilmer spun out of the top ten down the front stretch for a lap 28 caution. Doss again picked the outside and Herzog slid up the hill trying to run with him off the corner. That allowed Zampa to slide job Herzog on the following lap. Herzog bumped into the back of Zampa and also made contact with Dillon Tucker. The accordion affect ended with half a dozen cars stopped in turn three and a total of 11 cars suffering various degrees of damage. Four drivers were out of the race but all the leaders continued. Bakersfield’s Racin Vernon was one of those with heavy damage who soldiered on. Zampa emerged second and drag raced Doss on the following restart with a comfortable advantage over the battle for third between Eric Nascimento, Jr. and Erickson. A spin for Quintin Harris in turn four slowed action again. Zampa challenged Doss repeatedly on restarts and successfully took the lead on lap 33 when he edged forward by a nose before Doss took the lead back by a nose on lap 34. The side-by-side action brought Erickson into the fold on lap 35. The race went green into the lap 50 break with Doss leading Zampa, Erickson, Nascimento, and Jason Aguirre of Atwater. Aguirre fell back to ninth within the first seven laps after the break. Racin Vernon found a way to come back from the earlier crash to battle side-by-side with Tucker for seventh. Lapped traffic was two wide in front of Doss briefly on lap 65. Quintin Harris spun on the front stretch which evaporated Doss’ newfound lead on Zampa. The lead battle was as close as it had been with Zampa nosing inside Doss numerous times. A caution on lap 71 for Gilmer spinning gave the duo a breather. A severe crash stopped the action on the restart when Herzog slid up the race track and was hit in the right rear by Aguirre. Aguirre flew into the starter’s stand before landing on the passenger side window of Herzog. All parties involved, including the officials, were uninjured. Zampa and Doss again went toe-to-toe after that 20 minute red flag. Doss never lost the lead but had to drop to the inside several times to make a defensive maneuver. Zampa worked inside Doss again out of turn two on lap 78 and Doss managed to lead by a nose before Doss drove to the bottom again to block the following lap. Zampa never relented from the inside as Doss searched high and low to defend. Zampa led the 80th lap by inches before Doss came back once more. The battle spilled over when Zampa spun in turn three and got hit by Nascimento which ended Nascimento’s evening. The fracas placed a Cinderella in second with Racin Vernon set to challenge Doss. Vernon went up the hill into turn one which allowed Doss to drive away. Erickson took over second from Vernon in the process. Zampa found himself in an absolute soup with a lot of contact as he attempted to drive into the top-five and take the points lead. A final caution on lap 94 set up Doss versus Erickson, but Erickson was unable to seal the deal. Jeremy Doss took the big victory ahead of Erickson, Jarrett Gilmer, Racin Vernon, and Logan Zampa. With incoming points leader Buddy Shepherd absent, Zampa took over the points lead by four points heading into September 23rd. Jesse Love IV’s fourth win in the 51FIFTY Energy Drink Jr. Late Models nearly clinches the title in a dominant season so far. The June and July races were the only hiccups in Love’s season so far. Love qualified third for the 75 lapper but grabbed the pole after the fan redraw. He led lap one ahead of fast-time qualifier Kolby Berry of Redwood Valley. Jr. Late Model first-timer Adam Lemke of Hollister jumped up into third ahead of Las Vegas drivers Tyler Reif and Kyle Keller. Gracie Trotter of Denver, NC slowed out of turn four on her first career start but gathered it back up in the 13th position on lap four. Jr. Late Model exhibition race winner Dylan Zampa of Napa ran sixth early on in his first televised series start. Good battling took place outside the top-five when July runner-up Kabe McClenny of Bakersfield passed Anthony Guimano for seventh and brought Jesse Burks with him. Duxbury, VT’s Peyton Lanphear spun in turn one for the first caution on lap 18. Another brief caution for debris slowed the action on lap 23. Keller spun from fifth for a caution on lap 24. Mead and Trotter came together in turn three while battling for eighth place sending Mead for a spin on lap 25. Both had to restart from the rear. McClenny got around Zampa for fifth coming through three and four to complete lap 33. A crash on lap 37 brought out a red flag when Lanphear and Guiamano hit the wall in turn three. Guiamano managed to continue on in the event. Reif tagged the wall from fourth on the restart and was forced to try to nurse the car to the lap 50 break. Mead and Guiamano collided on lap 47 in turn four to bring the race to its lap 50 break prematurely. On the restart the trio of Love, Berry, and Lemke took off comfortably from fourth running McClenny. Lemke worked his way underneath Berry and took second on lap 55. He had a straightaway deficit to Love and began crawling towards him before Mead spun with help from Reif. Berry spun from third on the following restart and collected McClenny who suffered severe front end damage to end McClenny’s night. Lemke hounded his teammate Love for the lead with ten laps to go. Jesse Burks took over third from Dylan Zampa and led a line of six cars in the intense battle. Keller nearly spun out of the group but kept going to keep the race green with two to go. Love was able to pull away from Lemke in the closing stages in a possible championship drive with Burks maintaining third for his career best finish ahead of Zampa. Gracie Trotter charged back to fifth as well. The 20 lap Mini Cup main event saw a first time female winner. The 2017 series for the youngest drivers at the speedway had been dominated by Tyler Reif of Las Vegas, but the 10 year-old was denied on this night by Avery Vivian. Vivian used a car she purchased the night before to lead the entire distance, with Reif working into second with five laps to go and settling for that position. Aaron Thomas finished third. A competitive field of Modified Super Toyotas dueled for 25 laps with Dave Lander getting the win. Lander led the first nine laps of the feature before a caution for Rian Bowman spinning in turn four tightened up the pack. Lander jumped ahead of second running Ryan Renyolds on the double file restart, allowing Patrick Geiger to nose up the inside of Renyolds. Lander took a .666 second victory over Geiger with points leader Bert Stephens in third. Renyolds failed to finish with mechanical problems. 11 Legends of the Pacific took the green flag for a 35 lap main event with a ten car invert. Stockton’s Keith Clement led early before Chad Nascimento took the lead. 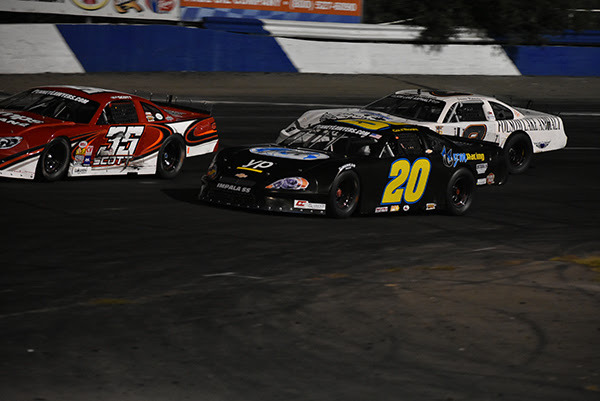 Nascimento drove to a five car length lead over Modesto’s Michael Ray. Tenth starting Luis Tyrrell, who leads the points at Kern County Raceway Park, passed Ray for second on lap six in a quick zip through the field. Tyrrell wasted little time taking the lead on the following lap on lap seven. Heather Hadley tagged the turn four wall for a lap 15 yellow flag. A caution for Rob Nascimento spinning gave his cousin Chad a brief look at Tyrell before a two-by-two battle for second developed. Another set of restarts allowed Ray to swoop into second. Tyrrell claimed victory for his second Madera Legends win of the season ahead of Ray, Rob Nascimento, Bakersfield’s Braden Rogers, and Josh Fleming.